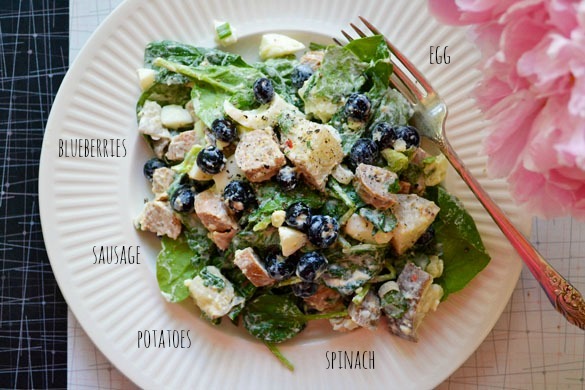 1Put your baby spinach into a big bowl and top or gently toss with the potatoes, sausage, egg, blueberries and green onion. 2To make the dressing, thin a big spoonful of mayo with enough rice vinegar to make it the consistency of a creamy dressing. Whisk or shake in a squeeze of grainy mustard, a pinch of sugar if you like, and a good grinding of black pepper. Toss with your salad or serve it alongside.